Where to click to get more Website information in Google Chrome? I want to know if the page I am interacting is secure or not. If a Web page is having "https" as part of the page address, it is a secured page. But if you want to know more information about this page, you need to use context menu in Google Chrome as shown in this tutorial. 1. Run Google Chrome and visit www.paypal.com Website and click "Log in" button. 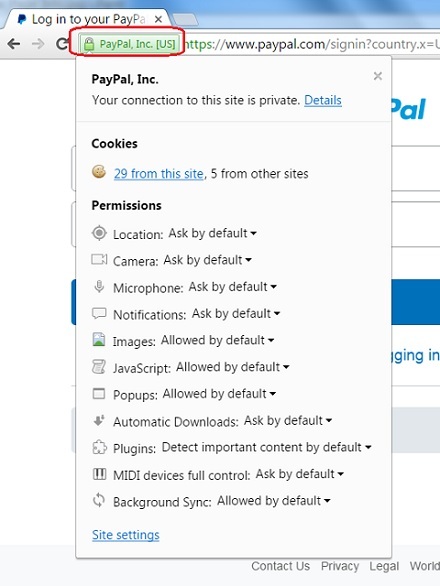 You see PayPal login page showing up with "https" as part of the page address. Your connection to the site is private. The first line confirms that your connection is secure. all data exchanged will be encrypted.  2019-03-18 question: I want more information than this. Inf FireFox, you can view media sources, as well other things. This is what I want to do.  2017-03-25 FYIcenter.com: @HostFission, we will provide the feedback to the Chrome.  2017-02-21 FYIcenter.com: @Christopher, Thanks for your comment. We have updated the tutorial based on the new behavior of Chrome 56.